Two late penalties from Ezra Hinchliffe gave Heath an 11-7 home win over Pontefract yesterday and confirmed their status as the team most likely to chase home Moortown at the top of Yorkshire One. Coach Dave Harrison labelled his side’s performance in the clash of the second and third-placed teams as “poor” but conceded that it was all about the result on a grey but fine afternoon. The North Dean men are 10 points behind the Leeds side, who had beaten them the previous week, and their biggest challengers now appear to be Old Crossleyans, up to third and seven points behind Heath with a game in hand. Normally the champions are promoted and the runners-up face a play-off game against north east opposition to determine who also goes up. He said there had been a meeting of Yorkshire clubs last Tuesday and they had indicated that they wanted to retain the present system. A confident Pontefract side, who had won the first meeting 30-18 in late September, bossed the opening 20 minutes and might have had more than one converted try to show for their efforts. It came after four minutes, scrum half Craig Fawcett making good ground and stand off Liam Kay cutting through from 15 metres out for a score he converted himself. Heath were unable to impose themselves up front at this stage without new long-term injury victims Olly Cook and Ian Downsborough. A misfiring lineout and carelessness in possession also hindered their cause. However, Harrison’s men started to get to grips with the opposition in the second quarter and centres Issy Spooner and Ezra Hinchliffe both went close. The visitors’ Matthew Bacon was sin-binned on 34 minutes for what was adjudged a deliberate knock-on as Heath moved the ball near the try line but when a 30 metre driving maul was halted and the ball lost under the posts, a frustrated Heath turned round still trailing 7-0. Harrison’s response was to change his scrum half and both locks, sending on Michael Reynolds, Seiffe Boussadda and newcomer Alex Patrick. Heath remained in the ascendancy. Spooner burst through on the right and was foiled only by a superb cover tackle from Fawcett, Hinchliffe knocking on as he attempted to pick up and score. However, the powerful Spooner was not to be denied soon after, forcing his way over wide on the left for an unconverted try on 47 minutes. It remained 5-7 for the next half hour, Kay missing a chance to extend the visitors’ lead when pushing a penalty wide from the 22 line on 66 minutes. Errors were still blighting Heath’s play but their determined finishing burst proved decisive. Their forwards got the ball over the try line but were unable to ground it, then Pontefract collapsed a scrum as Heath marched towards the line. The home side settled for the easiest of Hinchliffe penalties to go 8-7 up entering the last 10 minutes and the same player put a little more daylight between the sides with an effort from the 22 line six minutes later. Prop Chris Moore knocked on from the restart to ensure an anxious finish for Heath but they eventually turned over possession and kicked the ball into touch. 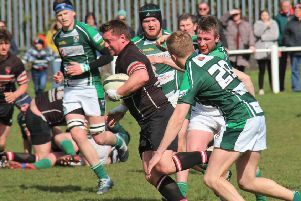 Harrison said: “They (Pontefract) play scrappy rugby well and are very abrasive. They put us off our shift a bit. “We were light years behind where we have been but I had told the players that I was not bothered if we won 3-0 or 6-3, as long as we got a win.